There is a very simple definition of modern U.S. coinage, which is a good starting point: modern U.S. coins are those struck from 1964 to date. All the coins described in 100 Greatest U.S. Modern Coins fall within this time period. The reader need go no further to have a very serviceable and accurate definition. As with many things that seem simple on the surface, a deeper look reveals complexity. For example, it would be easy to mischaracterize the above definition as “coins of relatively recent vintage.” This, of course, implies that the definition is a moving target, subject to change over time. In truth, it is not. Just as modern art defines a period of artistic production and connects works based on their content and character, modern coinage is more than a date range. Not all Mint products from 1964 should be considered modern. In the 100 Greatest U.S. Modern Coins, there are three entries from this year. One is the 1964 Special Mint Set—a set of coins with an unusual finish that replaced the Proof finish on coinage sets made for collectors from 1965 through 1967. The Proof set was put on hiatus while the Mint put all its attention on the production of new-composition coinage. 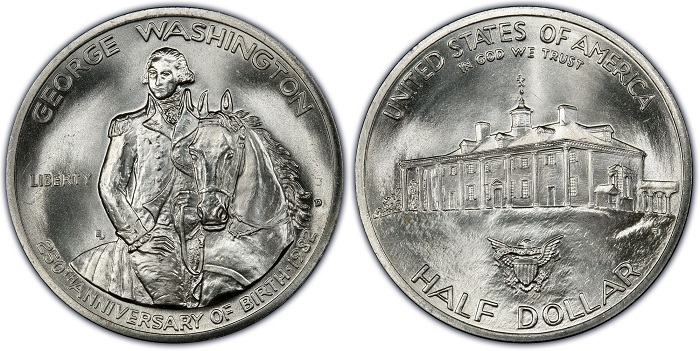 Another is the 1964, Reverse of 1965, Washington quarter, a coin that shows early use of a modified design created to suit the upcoming clad coinage. The third is the 1964 Accented Hair Kennedy half dollar, a first-year variety of a new, distinctly modern coinage series. All of these coins relate directly to the changes that were coming to the new coinage, and are modern for that reason. They are coins not entirely stuck in the context of pre-1964 issues. So the era of modern coinage began with the Mint figuring out how to smoothly transition away from the silver issues of previous years. For years after the change, coin design remained stagnant, playing on the collective memory of past silver circulating coinage. Even when the Eisenhower dollar was introduced in 1971, a non-circulating version containing silver was also released, helping to create the still vitally important association between a coin’s face value and its intrinsic worth. Not until 1979, nearly 10 years later, was this connection severed when a small-sized copper-nickel-clad dollar coin was issued replacing the original silver dollar of memory. Subsequent new coinage programs similarly recalled the past before heading in a new modern path. In 1982, the U.S. commemorative coinage program re-launched (the last U.S. commemoratives had been struck in the 1950s). The first coin was a silver half dollar, as nearly all the classic commemoratives issues had been. When Olympic commemorative three-coin dollar sets were sold in 1983, they were each comprised of a Philadelphia, Denver and San Francisco Mint issue, as the original commemorative P-D-S sets had been. At that time a new $10 commemorative coin followed, something novel enough to begin breaking ties with the commemorative coins of the past. In 1986, the first U.S. bullion coins were issued, in a program that had no historical antecedents in the United States. Even still, at this late date, designs were recycled from classic coinage issues for the obverses of both the gold and silver eagles. 1982 George Washington half dollar. With this coin, the United States’ modern commemorative coinage program began after a nearly 30-year hiatus. Eventually, these gradual changes gave way to dramatic experimentation. By 1999, the era of modern coinage at last had hit its stride. New designs were introduced five times every year on the state quarters issued from 1999 through 2008. A brand-new-composition dollar coin was introduced in 2000. Only faint connections can be drawn to earlier coinage. There is no doubt that these latter series are singularly modern. The Mint introduced a new “golden” dollar composition in 2000. Throughout the modern era of coinage, a significant consideration has loomed in the background: every coin’s design and composition needs to meet the demands of mass production. Modern coinage production is not an artisanal process. Instead, all modern coins are produced using very powerful, high-speed coinage presses in a refined mechanical process designed to create as many coins as needed. Technology and its limitations, therefore, also play a role in the story of modern coinage. No country produces nearly as many coins as the United States. The huge demand for coinage has been keenly felt throughout the era of modern coinage as the U.S. Mint has tested the upper limits of what is possible. Jeff Garrett and Scott Schechter are coauthors of the popular book, 100 Greatest U.S. Modern Coins, now in its 3rd edition.